The History of Fernando de Noronha. 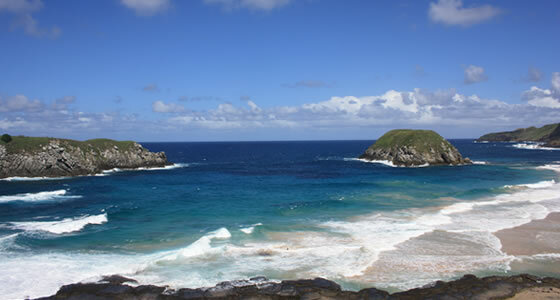 Fernando de Noronha is filled with a history of explorers, invaders, and soldiers. While today the people of Fernando de Noronha are focused on peace and preserving their environment, this was not always the case. The island has a violent history. The archipelago was originally noticed during expeditions in the early 1500s. Its first name was Ilha da Quaresma or Lent Island. One of those said to discover the islands was Gaspar de Lemos, a supply ship captain. He returned to Portugal with the first news of this discovery. Today historians believe it was Fernao de Noronha who actually discovered these islands sometime during 1501-1502. The first to actually make mention of Fernando de Noronha was Amerigo Vespucci in 1503.In 1534 the English took over the archipelago and held it until 1612 when the French took over. In 1628 the Dutch laid claim to the islands only to be ousted by the Spanish and Portuguese two years later. In 1635 the Dutch took control again and turned it into a hospital for soldiers. The islands were named Pavonia and it was not until 1654 that the Portuguese reclaimed the lands. In 1736 the French East Indies Company arrived at the islands. Finding them empty and abandoned they took control and renamed the archipelago Isle Dauphine. The French were removed in 1737 by the Portuguese. The Portuguese decided to strengthen the defenses of the islands and built 10 forts.Nine forts were on the largest island and the tenth was on the smaller Ilha de Sao Jose. A stone road system connected these forts. In 1770 the first settlers arrived and formed the village called Vila dos Remedios. Charles Darwin visited the islands in 1832. A prison was established on the island is the late 1800s. Fernando de Noronha was actually a political prisoner here from 1938-1945. The prison was closed in 1957. In the 1900s the British helped to establish a telegraph on the island. The French arrived later to install French Cable and the Italians came over too with Italcable. In 1942 the islands were made a Federal Territory and the prisoners were removed. An airport was built by the US Army Air Force to provide a link from French West Africa to Brazil. In 1944 jurisdiction was given to the US Navy. By 1988 most of the islands were declared a national park and the land was added to the Brazilian state Pernambuco. Today the economy is mostly dependent on the tourists that visit the archipelago. There are restrictions to the number of tourists allowed on the island to prevent destruction of the delicate natural balance. Scientists visit the island frequently to study the flora and fauna. The area was named a World Heritage Site in 2001 due to its importance as a feeding ground for many different aquatic species, its large dolphin population, and as protection for the endangered animals like the hawksbill turtle.